Despite what those dour Starks would have you believe, spring is officially here as of Wednesday. You can tell because it's the time of year when Dairy Queen hosts its annual Free Cone Day and doles out free ice cream to remind you how much you like it after months of subsisting on soup. On Wednesday, March 20, Dairy Queen will throw its annual Free Cone Day celebration, serving up free small vanilla cones all day. You know those soft serve cones, the ones with a more pronounced curl than Johnny Depp in Cry-Baby. "We love that our tradition of Free Cone Day has become synonymous with the return of warmer weather and bringing people together," said executive vice president of marketing Maria Hokanson. "We know the start of soft-serve season brings joy to our fans and we can't wait to help spread smiles." The offer is available at any Dairy Queen or DQ Grill & Chill location that is not located in a mall, with a limit of one curly cone per person. If you can't get to a DQ on Free Cone Day, you can get a deal through the company's mobile app that is nearly as good. 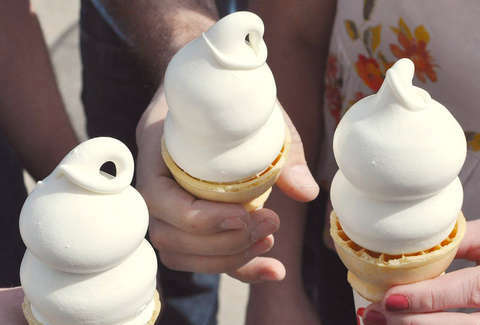 From March 21-31, the shops are offering 50-cent small regular or dipped soft serve cones. If there is not a Dairy Queen near you, Rita's Italian Ice will be handing out free frozen treats as well. Just stop into one of Rita's more than 600 locations, and you will get a free small cup of frozen ice in a flavor of your choosing. Like with the ice cream cones, there is no purchase necessary to get a cool snack. Otherwise, though it's not all that spring-y, Bruegger's Bagels is giving out free medium cups of Caribou Coffee with any purchase to celebrate the first day of spring. Even if there is still snow outside near you, it is time to eat ice cream to collectively will spring weather to arrive ASAP.